Diamondbacks Manager Torey Lovullo was improperly denied a pitching change during Thursday night's game against the San Francisco Giants, crew chief Bill Welke telling a pool reporter that Arizona should have been permitted to substitute pitcher Brad Ziegler with TJ McFarland, according to D'Backs writer Zach Buchanan. Umpires may have gotten a rule wrong in ARI. 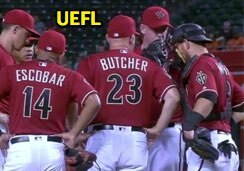 In this edition of Ask the UEFL, we figure out what happened in Phoenix and what interpretation did the crew apparently get wrong? Preliminaries: Baseball's pitching change rules are quite complex, which explains, in part, why a rules misapplication pertaining to this specific portion of the rulebook is possible. 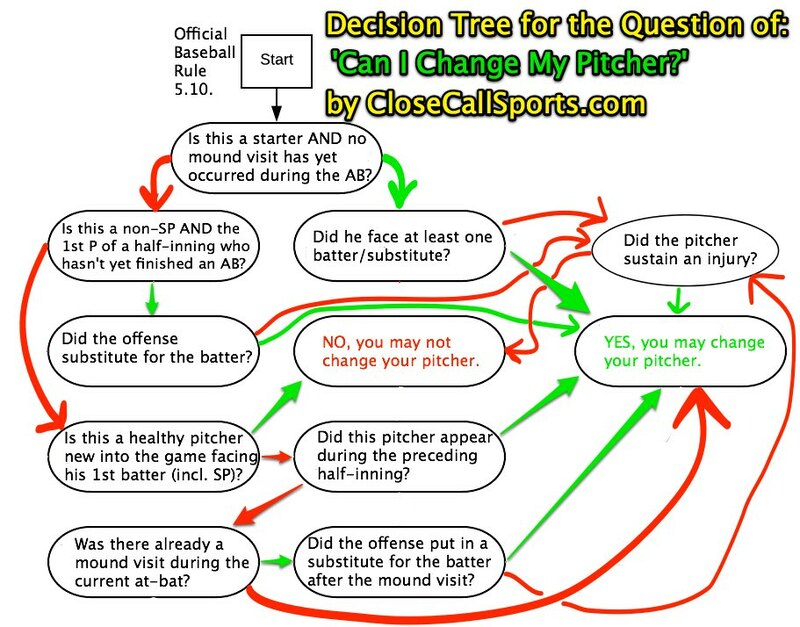 To make things slightly easier, we've created a decision tree graphic for Rule 5.10, which anyone can use to answer the question, "Can I Change My Pitcher?" The Play: With one out and two on (R1, R2) in the top of the 8th inning of the Giants-D'Backs game, Diamondbacks pitcher Ziegler surrendered a single to Giants batter Gorkys Hernandez to load the bases. Following the conclusion of play, Diamondbacks pitching coach Mike Butcher visited the mound, after which San Francisco inserted Alen Hanson into the game to pinch hit for regularly-scheduled batter Chase d'Arnaud. For those keeping score, Ziegler is a right-handed pitcher, d'Arnaud is a right-handed batter, and Hanson is a switch hitter. For SF, it would be more advantageous to put Hanson in the game to face Ziegler, and for ARI, it may have been more advantageous to replace Ziegler with a substitute. Click the image to access the decision tree. 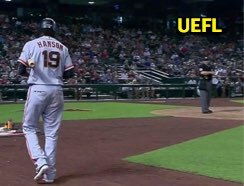 Lovullo exited his dugout shortly thereafter, purportedly looking to respond to San Francisco's substitution with a pitching change, but was allegedly told by HP Umpire Tony Randazzo that he could not substitute his pitcher. The Rule: Official Baseball Rule 5.10 is entitled Substitutions and Pitching Change (Including Visits to the Mound) and covers this play. 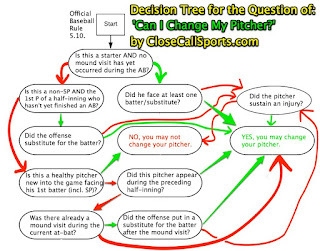 The following discussion pertains to 5.10's relevance to this play, or you can click the corresponding decision tree graphic to see the relevant process in determining whether this is a legal pitching change request. 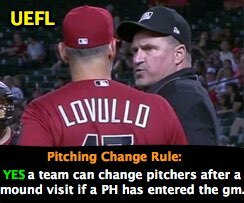 5.10(l)(3) is the rule Welke and his crew enforced in Arizona: "The manager or coach is prohibited from making a second visit to the mound while the same batter is at bat, but"
Technically speaking, Butcher visited the mound while d'Arnaud/Hanson's spot was at-bat. If 5.10(l)(3) was the totality of the rule, the umpires would be correct in prohibiting Lovullo's substitution request. ARI has a mound visit upon d'Arnaud's at-bat. However, there exists 5.10(l)(4)—which makes the terminal portion of provision (3) (", but") look less like a grammatical error and more like a deliberate attempt to draw attention to (4)—"if a pinch hitter is substituted for this batter, the manager or coach may make a second visit to the mound, but must remove the pitcher from the game." 5.10(l) Comment states that a manager who attempts to circumvent 5.10(l)(3) regarding a second visit to the same pitcher while the same batter is at-bat shall be warned to stop and if he continues through the umpire's order, the manager shall be removed from the game (e.g., ejected) and the pitcher required to pitch to the batter presently at-bat until the at-bat's conclusion, after which the pitcher shall be substituted for. Hanson's PH entrance allows for a 2nd visit. Obviously, the aforementioned 5.10(l) Comment does not apply here, since 5.10(l)(4) takes precedence over 5.10(l)(3), as a pitch-hitter was announced. History: MLB has a history of improper application of Rule 5.10(l), formerly 8.06—it's a tricky rule! In 2013, Tim McClelland's crew improperly required Dodgers pitcher Jonathan Broxton to leave the game immediately instead of forcing him to face the batter then-at-bat after Dodgers manager Don Mattingly made a second visit to the mound during the same at-bat (with no pinch hitter in the interim). Related Post: Mound Visit Madness and MLB Rule 8.06(c) (7/10/13). And in May of that year, Angels Manager Mike Scioscia protested a game against Houston after Fieldin Culbreth's crew improperly allowed Astros Manager Bo Porter to replace his relief pitcher in response to Anaheim's Los Angeles' decision to bring in a pinch hitter (by rule, a substitute pitcher newly introduced into the game must face a batter, even if the batter is a pinch hitter...a pitcher already in the game may be removed during or prior to such at-bat). Conclusion: According to Buchanan, Welke's admission of error corresponds to the explanation and analysis provided above: a team cannot make a second mound visit during the at-bat unless the batter is replaced with a pinch hitter, in which case the defense can make a second mound visit, but must remove the pitcher from the game. Taking it a step further, if the offense decided to replace its pinch hitter with another pinch hitter from the bench (which the team at-bat is legally allowed to do), the defense would not be permitted to replace its pitcher: a new pitcher into the game must face a batter (we learned this with the Angels protest in 2013). Since Ziegler was a pitcher already in the game, he should have been permitted to be removed as soon as San Francisco substituted Hanson for d'Arnaud. Whereas Scioscia protested his game (it was a moot point—the Angels won), Lovullo did not protest Thursday night's game against San Francisco.